monogrammed lower right: St. B. 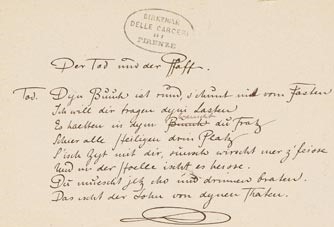 The Daulton Collection contains ten autograph poems about death that Karl Stauffer-Bern composed while in prison in Florence, only ten months before his own death by suicide; the collection also contains the signed, autograph letter, dated March 19, 1890, also written in prison, sending these poems to his friend, the Swiss editor Albert Fleiner. 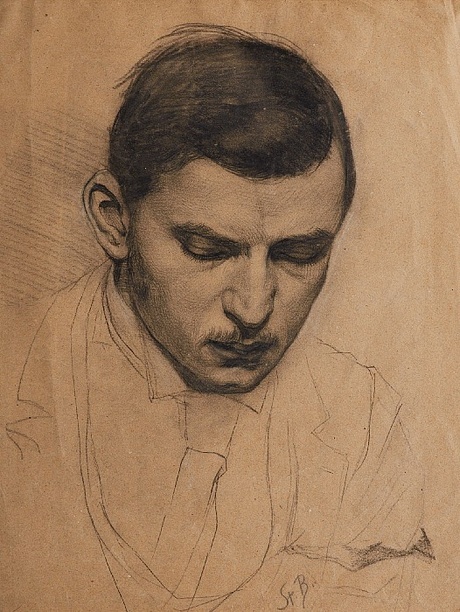 Some of these poems about death, including "Der Tod und der Pfaffe," were published posthumously in Familienbriefe und Gedichte von Karl Stauffer-Bern (Leipzig: Verlag der Sueddeutschen Monatshefte, 1914); see pages 393-403.